Democracy movements must try to stop the stolen elections now, and delegitimize any mandates claimed from them in the future. Only you and I can save democracy this time and for times to come. If we all play our part now, Obama and his popular majority will win. If not, we need to be clear and fortified for big confrontations ahead. Let’s look at where democracy movements must intervene to stop the hemorrhaging before a final collapse. Democracy movements must try to stop the stolen elections now, and delegitimize any mandates claimed from them in the future. 1. Let the people decide: Stop voter suppression. Among “registered but unlikely” voters, Obama leads Romney 43%-20%, and in favorability by 55%-25% [New York Times, Aug. 18]. Examples: a Pennsylvania Republican leader bragged in June about a voter ID law “which is going to allow Gov. Romney to win the state of Pennsylvania — done!” The Republican governor blocks plans in that state allowing voters to apply for absentee ballots or to register online. The naked Republican strategy is to make it as hard as possible for people of color, student, and the elderly to vote. Thanks to the civil rights movement, the 1965 Voting Rights Act provides tools to fight to maximize voter turnout. Local activists should be attacking their governors, legislators, and registrars for erecting unconstitutional barriers to voting, and for their refusal to permit early voting or provide enough accessible ballot boxes and election observers. Civil rights lawyers should mobilize to monitor and protest wherever the machines break down and the lines become too long in freezing weather. Ballot boxes should be installed on campuses. 2. Stop secret corporate money. Buckley v. Valeo  and Citizens United  have opened the sewage gates to secret money’s power to pollute the democratic process. In the next two months, all people can do is make righteous noise against these pernicious threats and force their disclosure in the media on an everyday basis. Besides attacking Sheldon Adelson [war against Iran] and the Koch brothers [big oil], the movement must make the case that this flow of private funds is creating a legitimacy crisis for democracy. This same worry apparently led Chief Justice John Roberts to narrowly approve Obamacare [but not Medicaid] while delegating its ultimate fate to the voters this November. President Obama has endorsed a constitutional amendment to reverse Citizens United, a good basis for a long-term organizing strategy. But what is really needed is a new generation of law students who aspire to be the Thurgood Marshalls of campaign finance reform, attacking Buckley v. Valeo as a perverted violation of the First and Fourteenth Amendments [money is not an unfettered instrumentality of speech]. Currently the weakest link in the Supreme Court’s case is the secrecy afforded big donors until after the election. A militant demand for disclosure before the election will put the Court and the Republicans on the defensive. There are other battlefronts in the fight for democracy, from greater transparency in the derivatives market, to disclosure of thousands of unregistered corporate lobbyists, to the need for a rewrite of the War Powers Act to rein in drones and secret wars. But the sharp point of the spear in the next two months are  the Republican plan to keep people from voting, and  the Republican plan to keep millions in campaign contributions secret until after the election. These lines of attack are complements to the growing hubbub about unprecedented levels of deceit by the Romney-Ryan ticket. They and Karl Rove believe that enough secret money and voter suppression can prevail. 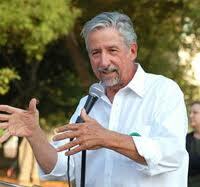 Tom Hayden is a former California state senator and leader of Sixties peace, justice, and environmental movements. He currently teaches at Pitzer College in Los Angeles. His latest book is The Long Sixties. One easy thing you can do today…right now! Register three new people to vote today. One neighbor to the right of you, one on the left and the one across the street. Hey, contact your friends on your favorite social media. No time to be seated in the stands as an observer, as recent voter victories will be ignored and appealed, re: Ohio and Texas. Older Article: Finally … some waves in OB! Amateur videographer and bogie boarder shares his views.